Description. Fresh leaf scars on var. bifolia reveal a yellow or tan periderm. On var. lasiocarpa, the periderm is red. On foliar buds, the basal bud scales are long, narrow-triangular to spathulate with crenate to entire margins. Leaves are 0.4 to 1 long by 0.06 inch wide (11 - 25 × 1.25 - 1.5 mm); when crushed they have an odor similar to camphor (less sharp of a smell then the type); lower needle surface has 3 to 5 lines of stomata on each side of midrib (4 to 5 on each side in the type); upper needle surface is light green to Blue-green, usually glaucous, with 3-6 rows of stomata at midleaf. 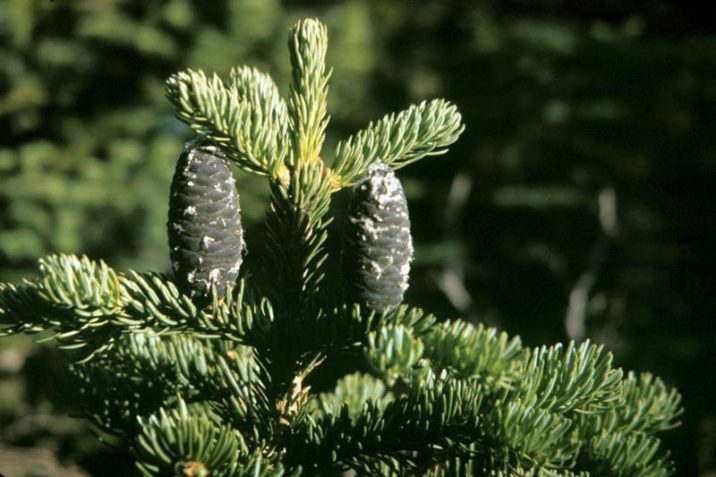 <Abies lasiocarpa var. bifolia at Glacier National Park, Montana.